BPM is a comprehensive management approach to continuously improving your business processes. 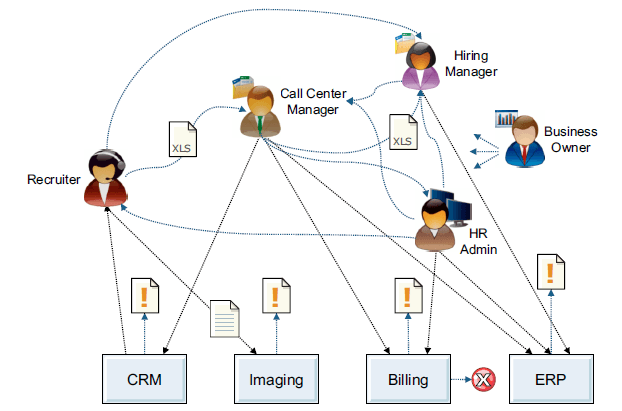 BPM is more than workflow automation. BPM promotes effectiveness and efficiency in your business processes by using measurable business value to align all projects with corporate strategies. BPM relies on an incremental delivery methodology that creates process visibility, enabling process control in your business. Process definition with BPMN in IBM Blueworks Live. Process automation, visibility, and control are compounding elements of the business impact realized from a BPM project. Process automation immediately accrues business value by increasing efficiency, reducing errors, eliminating process variation, and removing rework for human tasks. 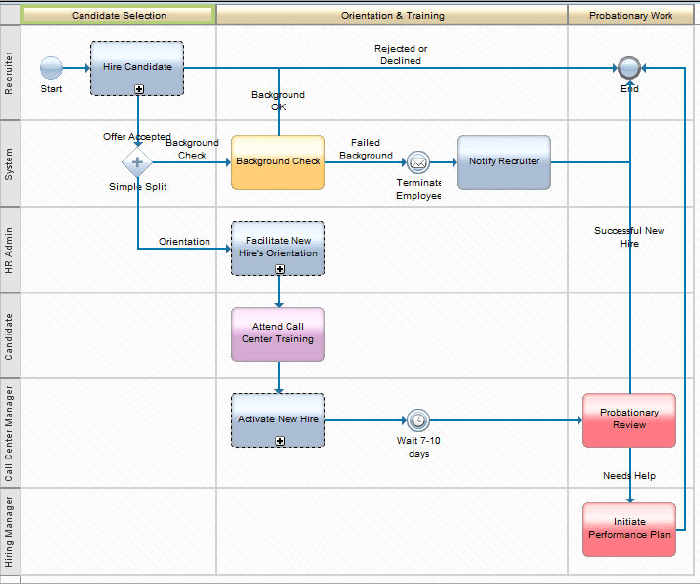 How will a BPM implementation help my organization? Efficiency: Eliminate manual data entry, reduce process cycle time, reduce manual analysis and routing. Effectiveness: Handle exceptions faster and better, make better decisions, consistent execution. Agility: Faster regulatory compliance, support for new business models and increased ability to innovate. 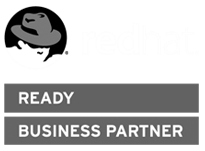 An unmanaged process suffers from poor visibility and lack of control. A managed process with real-time visibility and control brings order to chaos with constant improvement. Is the implementation process of BPM generally a smooth process? Simply said, no. In most cases enterprises delve into a BPM project without enough background on the topic and a lack of understanding of an adequate enterprise architecture or business and physical infrastructure required to succeed. To generate a successful quick win project the right process needs to be picked, the infrastructure has to be in place and performance or scalability problems out of the question. Furthermore, once the process is up and running the evolution should continue organically within the company with the right team, establishing the critical mass and skills to move forward. How can you help us with BPM? Our team uses IBM BlueworksLive for the vital aspect of business process and decision discovery, IBM has been working hard to integrate the generated processes and decisions into both their BPM and ODM tooling. As for the actual process design and execution, while there are plenty of BPM platforms and vendors, we trust our time and that of our customers to IBM Business Process Manager. IBM BPM is based on IBM WebSphere and works flawlessly with both DB2 or Oracle as database engines. There are a variety of implementation options, from single virtual machines running BPM Express to a multi-node BPM cluster with a pattern for HA and DR with distributed geographies. Starting with the right tool from the start is key to mass adoption in the future. Is BPM only for large scale enterprises? No, BPM can help small and medium sized businesses as well. From process discovery to get everyone on the same page, to process automation to provide efficacy to budget conscious or short-staffed companies, BPM can increase the execution speed and accuracy of all business sizes. We've seen the infrastructure footprint of a BPM implementation in some companies, are all implementations large and complex? We can help companies implement small footprints if the requirements are not complex. If the needs lie in discovery we can help implement a BlueworksLive practice, if a small design and execution environment is needed, we can help businesses implement a single instance of IBM Business Process Manager Express with very small CPU and RAM requirements for a small workgroup. As the business needs grow and the project gains traction, we can help expand the reach and execution ability of the implementation. Is BPM the solution to business application development? BPM does NOT solve all software development troubles and barriers for an enterprise. 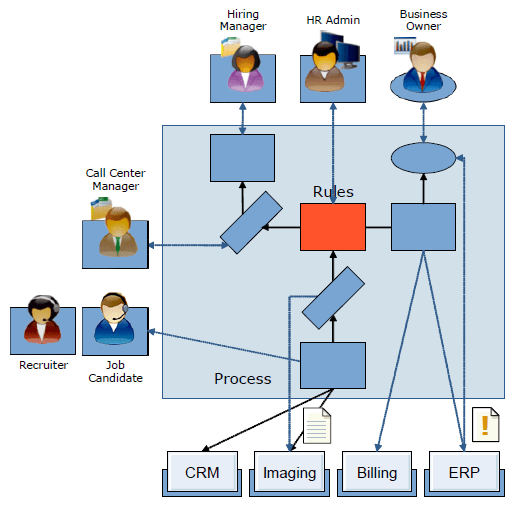 It is true, that building processes with an integrated execution environment improves the maintainability and reusability of a system, however a BPM process in execution is generally geared towards business flows where there is interaction of different systems and/or individuals with rules and parameters along the way, usually ending up in database transaction of some sort. BPM is not the tooling of choice for system of record type of requirements, it’s a complement that can efficiently orchestrate systems of engagement with database transactions in systems of record.